I’m loving the look of wide horizontal stripes in decorating at the moment. At first the inclination started with fabric, but then it also moved on to painted and wallpapered walls. I love how pretty the coral looks against the white and how the drapes give this dining room an unexpected pop of color. These tangerine striped drapes are similar, but muddied down a bit not to overpower the patterned navy rug. Horizontal stripes seem to add an element of sophistication to a room that isn’t typically a formal living space, as apparent in this beautiful girl’s room. A little less commitment, but still the same effect is painting horizontal stripes on the wall. This tone-on-tone paint treatment is a quiet statement that adds a layer to the room, but doesn’t compete with the blue-green drapes. When I saw this dining room I had to pick my jaw up off the floor. The soft grey stripes added to an almost entirely white scheme are the piece de resistance of this room (not to mention the fantastic oversized lighting fixtures and soft blue dresser). 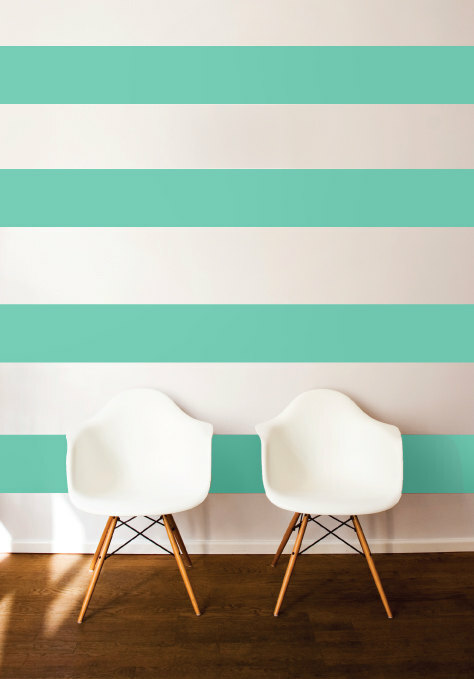 Another option is using decals to add horizontal stripes to a wall. Isn’t this pairing of mint and white fresh? I definitely plan on incorporating horizontal stripes in one of my own upcoming room updates. I’m on the look-out for fabric to make new drapes for our living room and I’ve thought of painting subtle stripes in the front entrance. Of course I don’t want to get carried away, so I’ll probably do one and then consider the other. You’ll have to wait and see what I come up with! What do you think? Do you share my love of wide horizontal stripes? Are you drawn to the subtle tone on tone or the bold and defined? Oh girl we are so on the same wave length!! i just wrote a post on this the other day! its posting Tuesday you’ll have to check out what i did! Can’t wait to see it! Have you come across any nice horizontal striped fabrics in your travels? I SO agree! Loving them right now too and those pics are fabulous. I just did some in my little boy’s closet. I’m turning it in to a reading nook! Love it! After seeing this I definitely know what I’m using as window coverings in my dining room! I never want anything plain and blah, so this is perfect and will add just the right amount of sophistication I need to that room! Thanks for sharing! Love stripes! I need to find a way to incorporate this into my home! Really beautiful! Thanks for the inspiration! I like the ones that pop with color! This post is just gorgeous – thank you, Shauna, for sharing this fabulous trend. And I totally agree with you – the photo with the light grey stripes on the wall made my jaw drop, too! Love the horizontal striped Shauna – lovely inspiration! Sooooo beautiful !!!!! I just had to tweet & fb ………………. Looking forward to seeing how you add stripes to your decor!